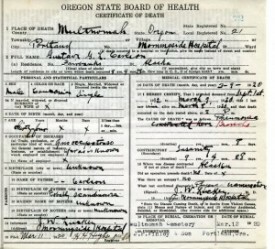 Researchers Niesje Steinkruger and Meg Greene, both of whom are retired Superior Court judges, have made incredible progress is locating and documenting Morningside patient court records. Below are photos of some of the things they've found with descriptions provided by Niesje. This photo (L) is of a subpoena given to the Federal Marshall by the Judge. Subpoenas were issued for the alleged insane person and the witnesses. Summons were also issued for six jurors. All persons alleged to be "insane and at large" had a 6 person jury trial. 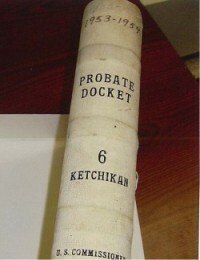 This (R) is an example of a Probate Docket book from Ketchikan. Inside are records of Estates, Guardianships, Adoptions and Sanity court cases. 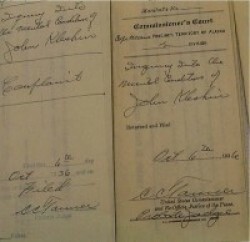 This photo (L) is an example of a page from a Ketchikan docket book from 1953. The amount of information varies from date to date and location to location. Some have entries with basic information only. Others have complete verbatim documents and testimony summary. This photo (R) is of the vault in the Clerk of Court Office in Nome, Alaska. The vault was barged to Nome during the Gold Rush. 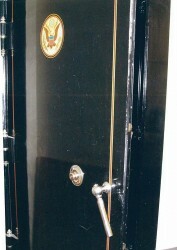 We found the Probate Docket books in this vault. 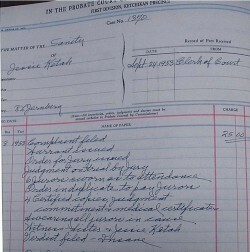 The Probate Docket books have entries for the sanity proceedings from the late 1800's to 1960. 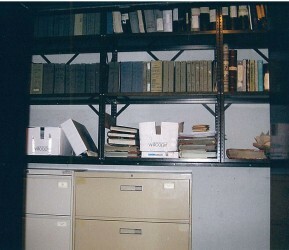 This (L) is the inside of the vault in Nome where historical files, journals and dockets were kept. In early days, gold was also kept here.